Electric heat tracing also known as Electric trace heating or surface heating, is a system used to maintain or raise the temperature of pipes and vessels. Trace heating takes the form of an electrical heating element run in physical contact along the length of a pipe. The pipe must then be covered with thermal insulation to retain heat losses from the pipe. Heat generated by the element then maintains the temperature of the pipe. Trace heating may be used to protect pipes from freezing, or to maintain process temperatures for piping that must transport substances that solidify at ambient temperatures. Electric trace heating cables are an alternative to steam trace heating where steam is not available or unwanted. 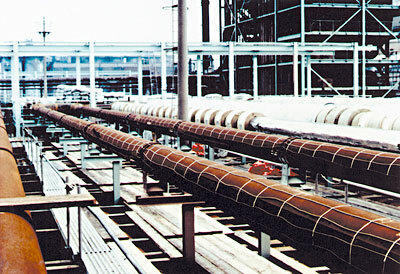 Every pipe or vessel is subject to heat loss when its temperature is greater than ambient temperature. Thermal insulation reduces the heat loss but does not eliminate it. Trace heating is used to replace the heat that is lost to atmosphere. If the heat replaced matches the heat lost, temperature will be maintained. An ambient temperature sensor can be used to energize the heating cable before the ambient temperature drops below freezing, 40°F is used as a standard. Placement of heat trace cable on roofs or in gutters to melt ice during winter months. When used in gutters the cable is NOT meant to keep the gutters free of ice and/or snow. The purpose is to keep a free path for the melted water to get off the roof and down the downspout or drain piping. Hot water service piping can also be traced, so that a circulating system is not needed to provide hot water at outlets. The combination of trace heating and the correct thermal insulation for the operating ambient temperature maintains a thermal balance where the heat output from the trace heating matches the heat loss from the pipe. Self limiting or regulating heating tapes have been developed and are very successful in this application. A similar principle can be applied to process piping carrying fluids which may congeal at low temperatures, for example, tars or molten sulfur. Hit-temperature trace heating elements can prevent blockage of pipes. Industrial applications for trace heating range from chemical industry, oil refineries, nuclear power plants, food factories. For example, wax is a material which starts to solidify below 70 °C which is usually far above the temperature of the surrounding air. Therefore the pipeline must be provided with an external source of heat to prevent the pipe and the material inside it from cooling down. Trace heating can also be done with steam, but this requires a source of steam and may be inconvenient to install and operate. In laboratories, researchers working in the field of materials science use trace heating to heat a sample isotropically. They may use trace heating in conjunction with a variac, so as to control the heat energy delivered. This is an effective means of slowly heating an object to measure thermodynamic properties such as thermal expansion.